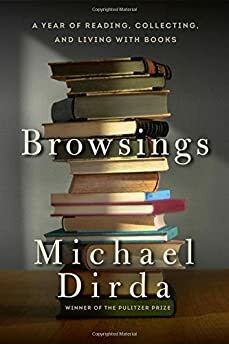 Largehearted Boy: Book Notes - Michael Dirda "Browsings"
Book Notes - Michael Dirda "Browsings"
Michael Dirda's Browsings is a smart and compulsively readable book about reading, writing, and literature from a distinctly personal perspective. "This joy-filled, reflective collection makes perfect bedside reading. Literate but never snobby, this collection of essays surely will entertain and enlighten book lovers of all stripes." Nietzsche once wrote that "without music life would be a mistake." While one can argue with the great German philosopher about many things, this isn't one of them. When I was writing the pieces that make up Browsings: A Year of Reading, Collecting, and Living with Books, I would sometimes end the day's work by putting some favorite disc in the CD player or on the turntable. I'd relax, occasionally sip a beer, and quite regularly feel sorry that I couldn't play music all day long. Why not? Because I can only write by mouthing words aloud in my head, and for that I need quiet or at least nothing more distracting than random noise. But music, almost any music, demands to be listened to. Old rock and roll quickly sets me daydreaming about my vanished youth. Country-and-western songs make me feel so lonesome I could cry. Hip-hop hurts my ears. Classical works—apart from some 18th-century chamber pieces—tends to demand particularly close attention. That's true of much jazz, too. I probably most enjoy listening to music on long car trips. There's nothing like, say, the soundtrack from The Good, the Bad, and the Ugly to keep you awake at 2 AM on the Pennsylvania Turnpike. I especially recommend the "Ecstasy of Gold" section toward the end, when composer Ennio Morricone pulls out all the stops, then adds church bells. Once upon a time in the west, I mean New York, I spent some time with Christopher Frayling, then head of the British arts council, who said that whenever he had to attend an important meeting, he'd play "Ecstasy of Gold" beforehand. Fully pumped and feeling like Clint Eastwood in a serape, he'd be ready to face any budgetary committee. As a kid from a Slavic working-class family, I took years of accordion lessons. Start the "Beer Barrel Polka" and I'm still ready to hit the dance floor while singing along as loudly as possible. When I got to Oberlin College, I heard live classical music for the first time. George Szell and the Cleveland Orchestra came to Finney Chapel to play Sibelius's Second symphony. After those thrilling crescendos in its last movement, I walked out of the concert saying to myself—to quote Ira Gershwin-- "How long has this been going on?" Soon afterwards, I persuaded a conservatory student to suggest a dozen standard masterpieces I should listen to. His list included Beethoven's Seventh Symphony, Debussy's "Afternoon of a Faun," Stravinsky's "Rite of Spring" and Wagner's "Tristan and Isolde." Over three particularly memorable evenings, while sitting in a sound-proof booth with headphones around my ears, I listened, mesmerized, to Wagner's opera. To this day, my hands will break into a sweat when I hear the Love Duet or the Liebestod, especially when sung by Kirsten Flagstad. No wonder that a century ago mothers would prevent their daughters from hearing this once controversial masterpiece. In its climax--nothing less than sexual rapture translated into music--Isolde's yearning voice rises, then falls, then rises again, competing with the orchestra, reaching impossible heights, before finally breaking into an orgasmic, soul-shaking cry of ecstasy, then slowly sighing away as the opera comes to a close. Pop songs: "The Way You Look Tonight," sung by Margaret Whiting; "I Was the One," sung by Jimmie Dale Gilmore; "Cry Me a River," sung by Julie London; "Smoke Gets in Your Eyes," sung by the Platters; "Maybe It was Memphis," sung by Pam Tillis; "Bridge Over Troubled Waters," sung by Paul Simon and Art Garfunkel; "American Pie" sung by Don McLean. Concertos: Beethoven Fourth Piano concerto (Leon Fleischer, with George Szell and the Cleveland Orchestra); Bruch, Scottish Fantasy (Heifetz); many others. Symphonic works: Berlioz, "Symphonie Fantastique"; Mendelssohn, Overture of "A Midsummer Night's Dream"; many others. Classic rock: "Shout," (Dion and the Belmonts); "Louie, Louie," (The Kingsmen), "Satisfaction," (The Rolling Stones), "Stairway to Heaven" (Led Zeppelin). Okay. That's enough writing for today. In fact, I do believe it's time for that beer and, let's see, should it be one of the Mozart piano sonatas, played by Mitsuko Uchida, "Deep River Blues," by Lou and Jim, or some early Diana Krall? No, none of them today. Given the season and the year, I think it's just the right time to listen to Samuel Barber's "Knoxville: Summer of 1915," sung by Leontyne Price.